(Name) don't have a cow you're only (Age) now! Happy B-Day (Name)! 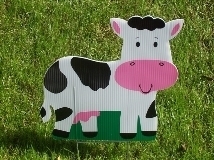 Have an udderly fabulous day! (Name's) an udder year older! Happy Birthday! (Name) it's your Birthday! Milk it for all it's worth! Mooos Flash! It's (Name's) 40th Birthday! You're 50 (Name), Party til the Cows come home! (Name), you've aged so graze-fully! Holy Cow, We herd (Name) is (Age)! Holy Cow, (Name) is (Age) now! Mooove Over (Age), (Name) is now (Age)! Have you herd the moos? It's (Name) (Age) Birthday! (Name) you don't look calf your age! Happy (Age)! (Name)'s (Age) today & that's no bull! Happy Birthday! We herd (Name) is out to pasture at (Age)! Happy Birthday! (Names) We are mooved by your love! Happy Anniversary! An udder year together! Happy Anniversary! Moos Flash! It's (Names) (Age) Anniversary! Holy Cow! (Names) are going on (Age) years now! Happy Anniversary! You're married (Age) years! Party til the cows come home! (Names) it's your Anniversary! Milk it for all it's worth! Milk it for all it's worth! Happy Retirement (Name)! Have an udderly fantastic retirement (Name)!